Mont Blanc in the French Alps? Milford Sound, one of the Natural Wonders of the World in New Zealand? Or are you ready to hang out on the Inca Trail in Peru? It's never a bad time to think about your next adventure, in fact, the hardest thing is deciding where to go. We are inviting you to HS Green for our Travel Social: our guest speaker tonight is Fiona, from the New Zealand based Active Adventures. Active Adventures operates trips in New Zealand, Europe, South America, and Nepal. They offer fully guided, all-inclusive, small group adventures that include hiking, biking, kayaking, and other activities. Their trips offer a blend of physical activities, friendly and knowledgeable guides, and legendary service in some of the most awe-inspiring locations on the planet. They can take you through the beautiful landscapes of New Zealand, Peru, Patagonia, Ecuador, and the Galapagos Islands, Nepal, and Europe to safely experience the outdoors, meet locals, eat and sleep well, and enjoy an adventure like no other. If you like to walk, trek, hike, paddle, cycle, snorkel or go to the gym, you'll love their trips! Whether you’re new to adventure travel, or you’ve never travelled in a group before, you’ll find yourself arriving home positively different from when you left. With the small groups (no more than 14), you'll get to know our team, your fellow travellers, and have the flexibility and freedom to do as much (or as little!) as you like. Come and hear more info on their tour offerings and decide which trip is next on your list! HS Green offers an extensive selection of both healthy and indulgent fresh options which include salads, wraps, and pizzas. Available beverage options are cold-pressed juices, smoothies, gourmet coffee, and an extensive array of wines and beers. 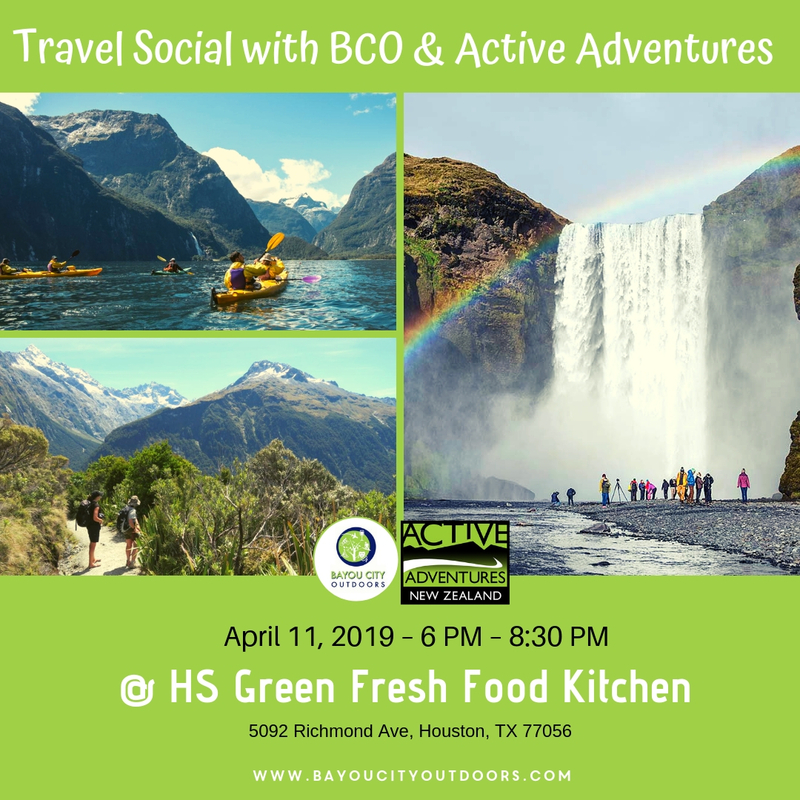 RSVP at https://bit.ly/2EC5DP4 For additional information, please call 713-524-3567 or e-mail to info@bayoucityoutdoors.com.